Make most of your Cambodia tour by spending nearly 3 weeks adventuring all amazing destinations in the Khmer Kingdom. From the gorgeous capital on upon a time to historical relics filled by legends and fairy tales, from pristine nature to dreaming beaches with endless sand and incredible undersea world. 20 days can bring you a ton of impression beyond your imaginations. Welcome to Cambodia, once you arrive in Siem Reap International Airport, the local tour guide will pick up you and take you to the hotel for check-in. Relax by a walk around your hotel to get on well with the locals or find somewhere to enjoy the sunset. 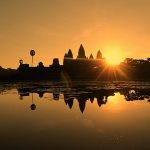 Get up early in the morning then head to Angkor Wat to see the sunrise. After that, climb up to the top of Phnom Bakheng to get the panoramic view of the temples area. 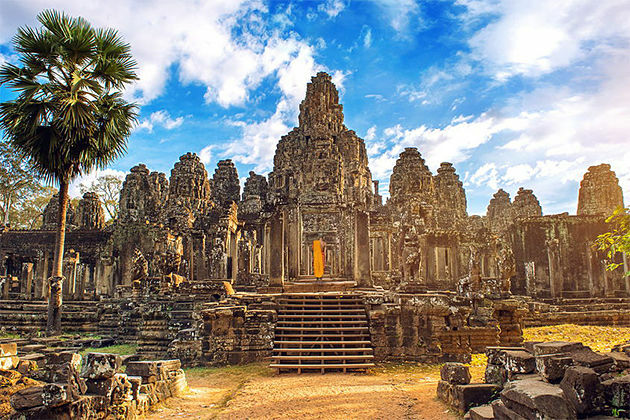 Then your trip should be the South Gate of Angkor Thom, Bayon Temple, Royal Palace, Peah Pilalay, The Terrace of Elephants, Terrace of Leper King. Benmelea, 70km northeast of Siem Reap, one of the most popular vegetation temple which was added to the UNESCO World Heritage Tentative List in 1992 in the Cultural category. Inside the temple, numerous abandoned stones lie as forgotten jewels swathed in lichen. The temple has also the same style with the Angkor Wat. Then, to a very first site of the ancient Khmer civilization was in Roluos known as Hariharalaya. The first was Preah Ko named after the Nandin statue found on site where has 6 brick towers dedicated to his parents, maternal grandparents, to King Jayavarman II and his wife. Additionally, Bakong is well known as a terrestrial version of the celestial Mount Meru, a five-tiered pyramid-temple. In the morning, the tour guide may meet you at 8:00 to begin an exciting day by a visit to Pre Rup before heading Bantay Samre Temples. Then drive to the countryside villages where you can see how the sugar palm is produced. In the afternoon, in order to avoid from the crowd of the busy high season, here are highly recommended itinerary: Peah Khan temple – Tam Son – East Mebon – Temples rice paddy. Spend a day and a night in a homestay with a local family and local project at Kra Bey Riel community. 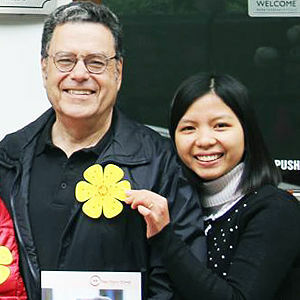 This is a great chance to get to know deeply the local customs and culture. Let yourself be free until the tour guide meets you early in the afternoon and take you with a 3-hour drive from Siem Reap to Battambang by private vehicle and check in your hotel. The rest of the day is your leisure to explore the city. Bamboo train, or nori, cannot be ignored once you arrive in Battambang. Basically, it is a bamboo flatbed on wheels, powered by a motor or small tractor engine. This would be one of your most unforgettable memories in your 20-day tour in Cambodia. Especially when you meet another train is coming in the opposite direction, just need to lift your vehicle up, wait it pass and put your train back to the rails. That’s amazing! In the afternoon, go to the circus Phare Ponleu Selpak before taking a tuk-tuk to the Killing Caves where Khmer Rouge soldiers pushed the victims to their deaths. End your memorable day by a visit to the Bat Caves at around 5:30 pm with a cup of beer to watch the spectacular view of thousands of bats flying out of the caves. Rent a bike at price $1 to $2 for a full day and ride follow the river toward Wat Ek Phnom, an Angkorian temple located on the left bank of the Sangkae River. The temple is an interesting place where is the center of holiday festivities for the people of the nearby village, along with the temple ruins. Your drive to Kampong Cham may take around 2 hours. Kampong Cham is one of Cambodia’s largest towns, which is located in the mighty of the Mekong River. In Kampong Cham, take a sightseeing tour to see the villages, experience the local life. After breakfast at the hotel, head to Kratie, which is well-known for lovely Irrawaddy dolphins. It is thought that fewer than 100 of the Irrawaddy dolphins inhabit a 190km stretch of the Mekong. The dolphins often hang out at Kampi, where you can hop in a boat with the price around $7 to $9 for one person. The best time to visit is the late afternoon which is the time for usual feeding and most active. It is also cooler and lovelier along the river. From Kratie, take a 3-4 hour drive to arrive Sen Monorom, the capital of Mondulkiri province. Check in your hotel. Then head to Bou Sra Waterfall, one of the most impressive falls in Cambodia, and plunge into the dense jungle below. The double-drop waterfall has a spectacular view that absolutely make you impressed. Comeback to Sen Monorom and spend the late afternoon for driving around to see the landscape and the Sea Forests. You should climb up the hill to enjoy the bird’s eye view and take some photos. On the second day in Mondulkiri, the local guide may offer an excellent elephant experience. Get into the Bunong Elephant Project to learn more about the character, behavior, body language of elephants. The most amazing thing is when you go swim with and wash the elephants. 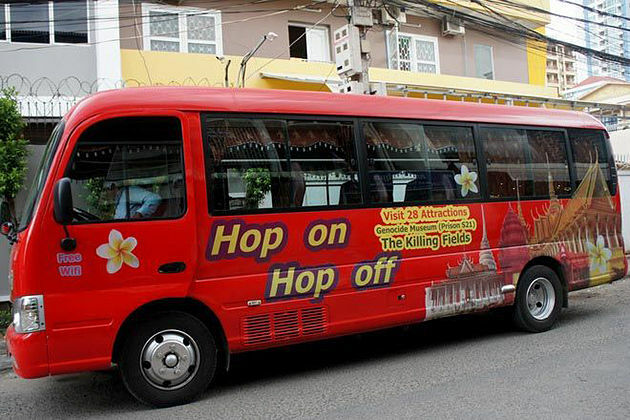 Transfer from Mondulkiri to Phnom Penh may take about 5 hours, thus, you will get to Phnom Penh in the afternoon. After check in your hotel, begin your experiences in Phnom Penh by taking a cooking class in which you have an ideal chance to get on well with the culture, cuisine, the manner on the table. The cooking class may include a short trip to the local market where you can buy the ingredients for your dishes. That would be a good beginning. The morning will be at your leisure. In the afternoon, our guide will meet you and take you to the National Museum (which is opened every day). The museum includes more than 5000 objects are on display such as Angkorian era statues, lingas, and other artifacts, most notably the legendary statue of the “Leper King”. Then head to Royal Palace serving as the residence of King as well as a venue for court ceremony. It is considered the symbol of the Kingdom. Located in the same compound with the Royal Palace is the “Silver Pagoda” which is unique amongst pagodas. Silver Pagoda is a place for the King meets with monks, Royal ceremonies have taken place, and for housing a collection of priceless Buddhist and historical objects like “Emerald Buddha”. Continue your city tour by a visit to Choeung Ek Genocidal Center, or The Killing Fields where the Khmer Rouge regime executed millions of victims. After the Khmer Rouge regime, memorials were set up at many of the sites containing the bones and remnants of dead people gathered from the area. After that, the tour guide will take you to the Toul Sleng Genocide Museum (S-21). Now it serves as a memorial and testament to the madness of the Khmer Rouge regime. In the afternoon, leave the pains of losses behind, relax by a trip to Russian Market where everything is on sale from silks and carvings, jewelry, many kinds of souvenirs to food and drinks stands in the middle of the market. 2-hour drive by private car will take you outside of Phnom Penh. Welcome to Kampot, a charming and peaceful town. Kampot will absolutely highlight your 20-day tour in Cambodia. Let be free today. You can choose one among these activities: cycle around Kampot’s City Center, motorbike up Bokor Mountain, visit the pepper plantations, kayaking the Green Cathedral or relax and swim along the river. 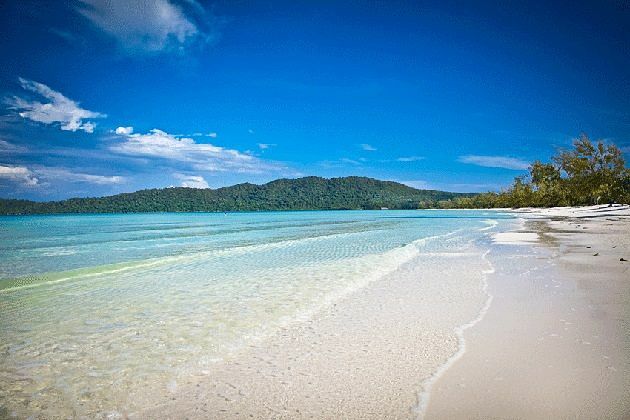 Just less than 2 hours with private vehicle, you arrive Sihanoukville, the Maldives of Cambodia with the pristine untouched white sandy beaches. Spend a day in your way to immerse into the beaches. 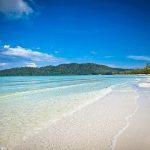 Sihanoukville is an ideal destination for water sports activities including a scuba diving trip to get the best view of coral and sea creatures lurking in the depth, snorkeling trips or having a flipper around. 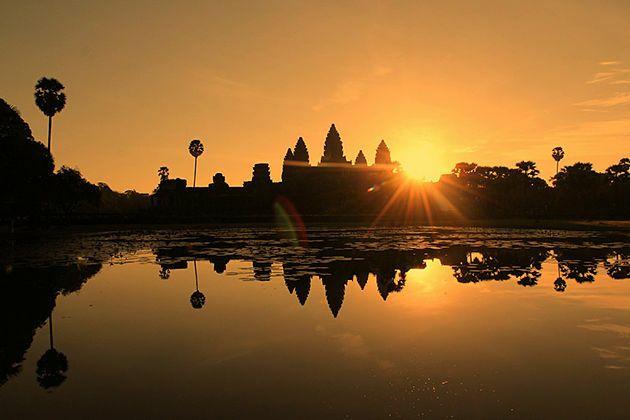 Spend time at your leisure before transfer to Siem Reap and end your 20-day tour in Cambodia.